The AstroCappella lyrics and original songs were written, performed, and recorded by the Chromatics, a vocal band based in Greenbelt, Maryland. The group has been performing together as The Chromatics since 1995. The Chromatics perform pop and rock covers and original songs inspired by our modern world. The Web, television, and fast food -- they're all subjects of Chromatics originals. The AstroCappella project was born when Padi Boyd and Alan Smale decided to combine their love of astronomy with their love of music and write a set of astronomically-correct a cappella songs to be used in classrooms. "AstroCappella 2.0" is the culmination of many years of effort in singing, songwriting, education, and public outreach. The first AstroCappella CD was a collection of six astronomy songs (several of which appear on this album). A total of 10,000 copies of the original music CD were distributed to teachers and other educators across the US and the world, free of charge and with minimal packaging. The first print run of this first album was supported by a grant under the NASA IDEAS program (Initiative to Develop Education through Astronomy and Space Science), awarded in 1997. Since then, The Chromatics have taken the AstroCappella project to new heights. They have presented AstroCappella at National Science Teachers' Meetings, workshops, symposia, and conferences from Orlando, Florida to Palm Springs, California, from downtown Baltimore to distant Hawaii, and from Las Vegas to Space Day on the Washington DC Mall. They have sung for audiences including astronauts John Glenn, Mae Jamison, and Jeri Ryan ;). Singing AstroCappella songs, The Chromatics have been featured on PBS and have appeared on CNN Headline News and local community television. AstroCappella lyrics have been quoted in the New York Times, and a copy of their original AstroCappella CD was flown in space on shuttle Discovery in December 1999 (STS-103). 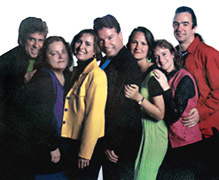 Aside from their AstroCappella work, The Chromatics have presented their rock, pop, choral, and Christmas repertoires at the Kennedy Center's Millennium Stage, at First Night Annapolis and First Night Alexandria, at several Atlantic Region Harmony Sweepstakes (where they took 3rd place in 1999). They have performed the National Anthem for the Baltimore Orioles (1995 and 1997), and provided holiday music for the White House's candlelight tours (1996) and CBS's WUSA TV 9 News (2000). The Chromatics also provide entertainment at regional festivals, corporate events, and science fiction conventions. The Chromatics' debut album, "First Light" (1998), contains four original songs and eight rock/pop cover songs. Some copies of this album are still available. 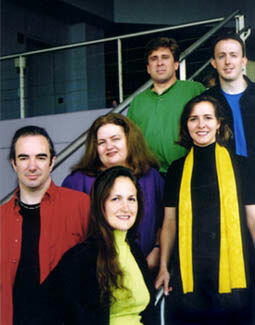 Their Christmas collection, "Unwrapped" (2000), contains 14 festive songs for the holiday season. The Chromatics were delighted when the "Unwrapped" album was nominated for national CARAs (Contemporary A Cappella Recording Awards) in two categories: Best Christmas Album, and Best Christmas Song (for "Silent Night"). They were extremely proud to be in the company of great groups like Rockapella, GLAD, and the Gas House Gang. "AstroCappella 2.0" was released in 2001, and was nominated for CARAs and WAMMIEs (Washington Area Music Awards). In 2003, The Chromatics released "Mixed Messages", a compilation of science, holiday, original, cover, live and studio tracks. AstroCappella 2.0 was produced by Jeff Gruber and The Chromatics. It was engineered and mixed at Blue House Productions, in Silver Spring, MD. We'd like to thank Laura Whitlock, Nick White (NASA/GSFC), and David Holdridge (USRA) for invaluable support during the early years of AstroCappella. We would like to thank Kara Granger for her copious input on the lesson plans for the first six songs. Thanks are also due to the teachers who have helped us test lyrics, lesson plans, and activities, including participants in the Prince George's County Middle School Science Teachers Workshop (1997), the North Bay Science Project (2001), and the many other workshops we've held at regional and national meetings. Permission is hereby given to print and/or photocopy the written materials for classroom use, and to broadcast the musical materials in an educational setting, as long as due credit is given to the composers and performers by listing the copyright statement, and a link (or text reference) to http://www.astrocappella.com/ is included. Contact us if you would be interested in receiving sheet music for the original songs, for use in classroom science or music programs. And, please let us know what you think of AstroCappella 2.0! Your comments: good, bad, or indifferent, are all valuable to us, and will help us to improve and refine this product in the future. Thank you for your interest in AstroCappella! - Padi Boyd, Alan Smale, and The Chromatics.